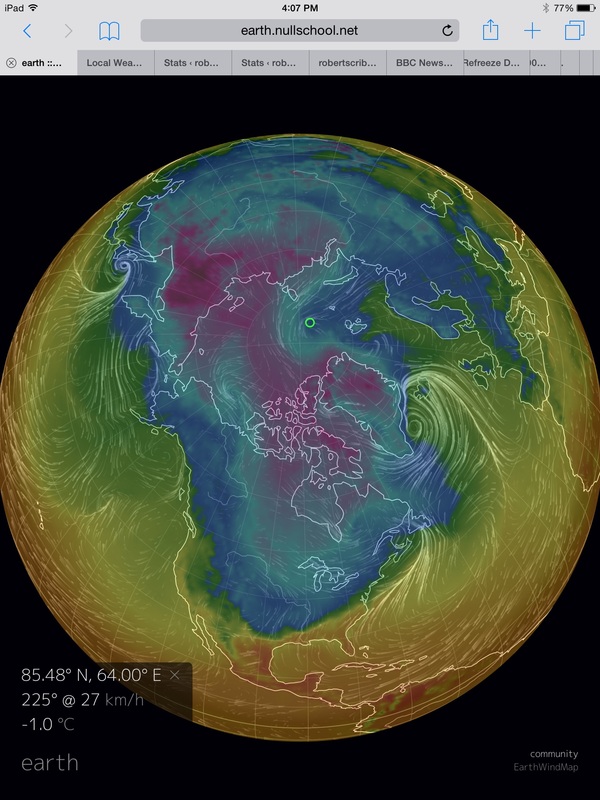 Arctic melt for the season of 2013 appears to be under way. 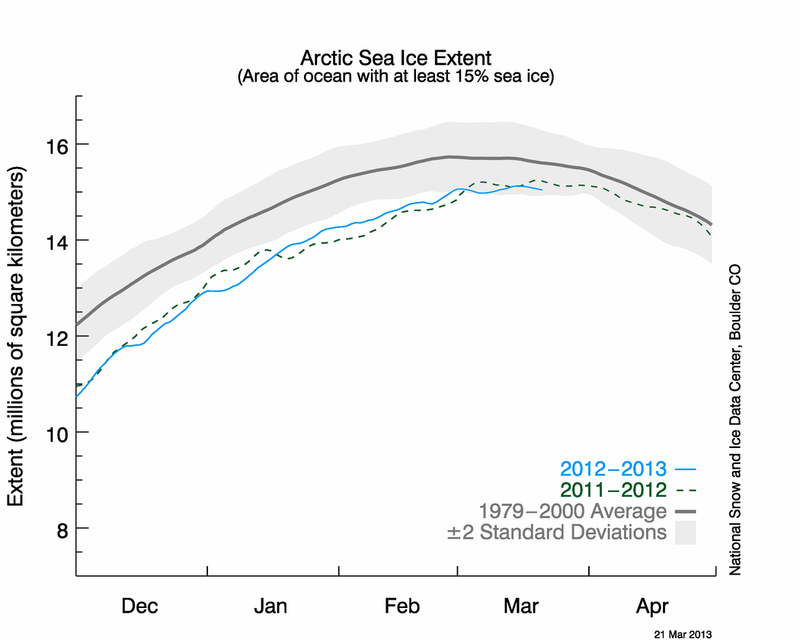 For almost a week now, sea ice area and extent numbers have been on the decline. 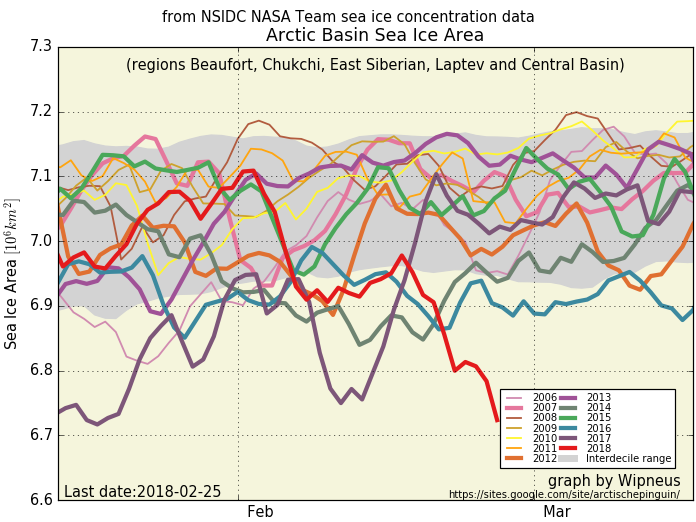 The above measurement, produced by NSIDC, shows current sea ice extent inching lower and ever closer to the two standard deviation boundary. Though both sea ice area and extent remain a little above record lows, a number of factors have come to dominate that may point toward a rapid melt once the season gets under way. 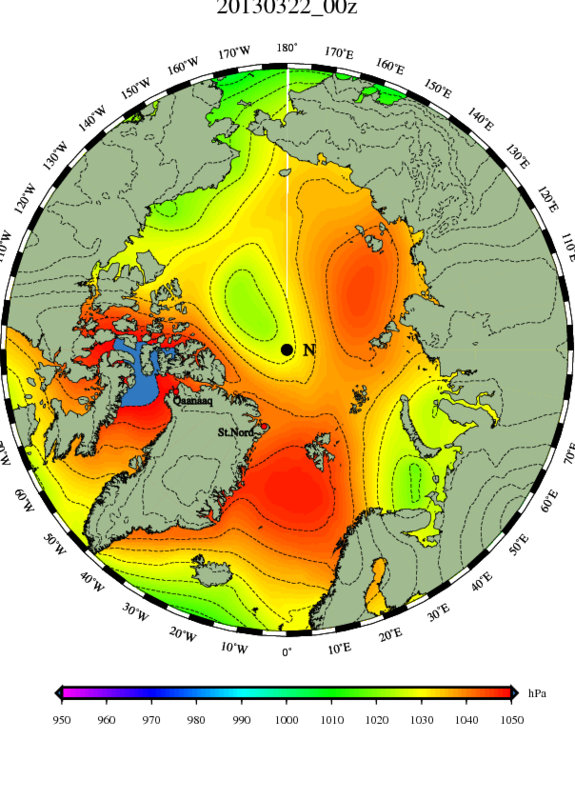 These include cracking, rapid ice movement, thin ice, warmer than average air temps, and negative Arctic Oscillation. 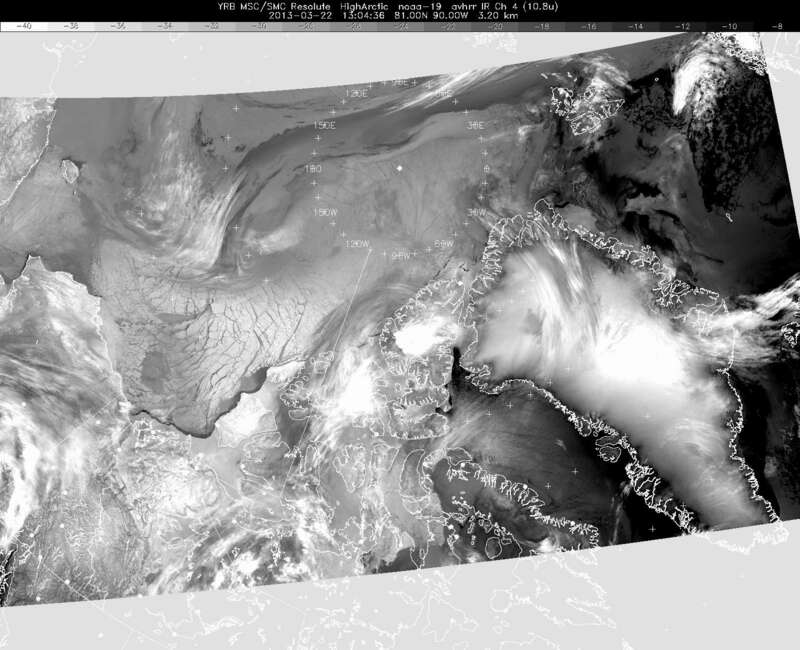 From Alaska to the Fram Straight, almost every break in the clouds shows fractured sea ice below. Broken ice melts much more easily than solid ice. The gaps are darker and therefore absorb more heat. The broken chunks are more exposed to the elements and mechanical forces that tend to enhance melt. Even worse, much of the Arctic’s last remaining thick, multi-year ice is shot through with cracks. This ice is supposed to be the Arctic’s most resilient. But its succumbing to cracking so early may well show that even this remnant is now involved in what appears to be an amplifying decline. 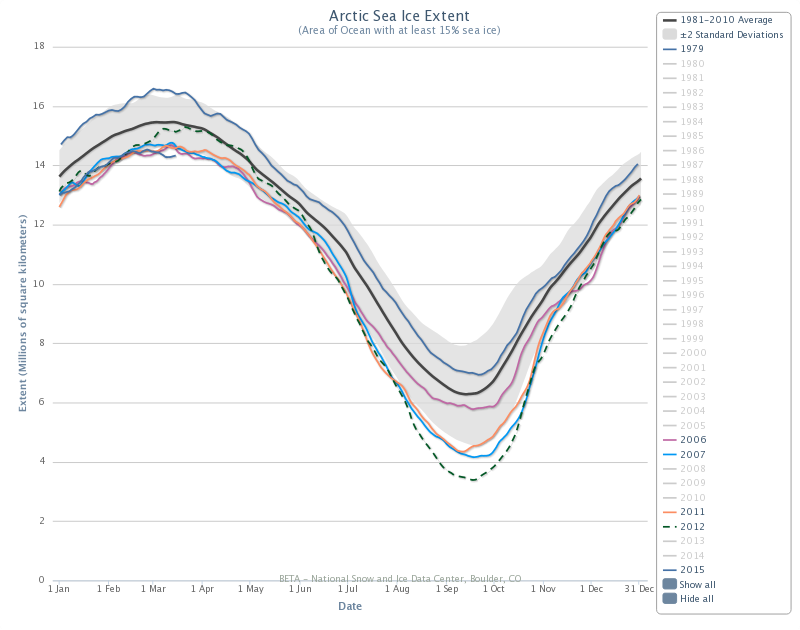 Likely aiding in this massive break-up of sea ice is rather rapid ice motion for the winter/spring of 2013. It appears that brisk winds pushed a large section of ice off Alaska and precipitated a clockwise shifting of the thinner ice. This ice, still connected to the denser, less mobile ice north of the Canadian Arctic Archipelago and Greenland, likely created the expanding ring of stress fractures as it moved. 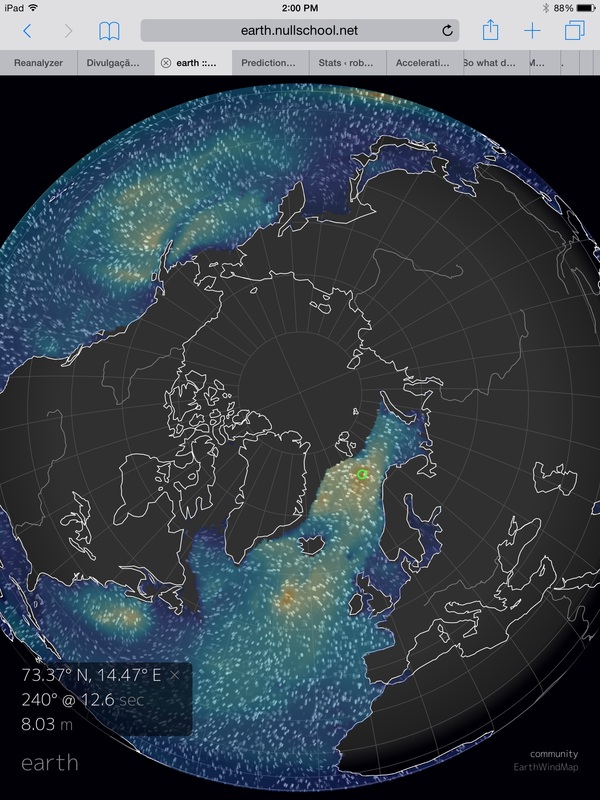 These brisk winds appear to be the result of an ongoing Arctic weather system set up by two blocking ridges — one near Eastern Siberia and the other near Greenland. These ridges both facilitated a clockwise field of winds while pumping warmer air into the Arctic. 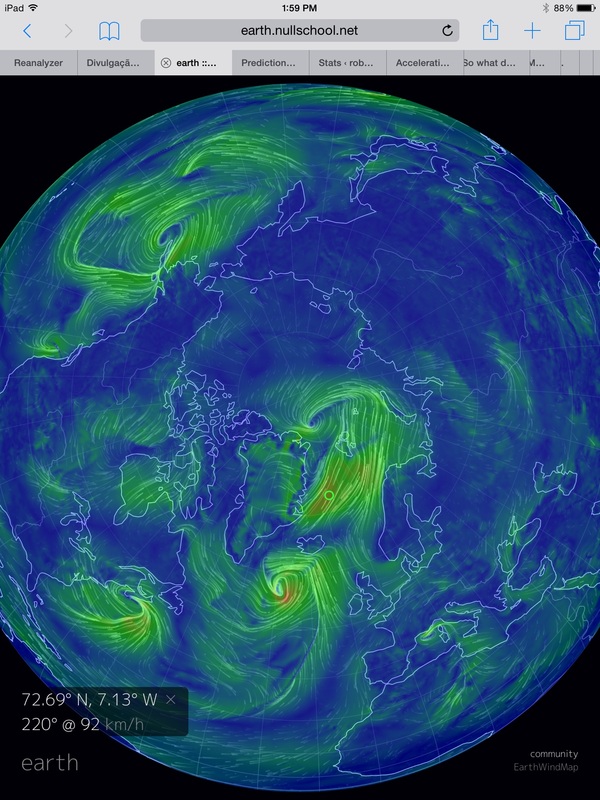 Over the past week, a powerful Arctic high pressure system formed and positioned itself near the North Pole. This high reinforced the clockwise wind pattern as it pushed the Arctic Oscillation into a strong negative phase (-5.5). 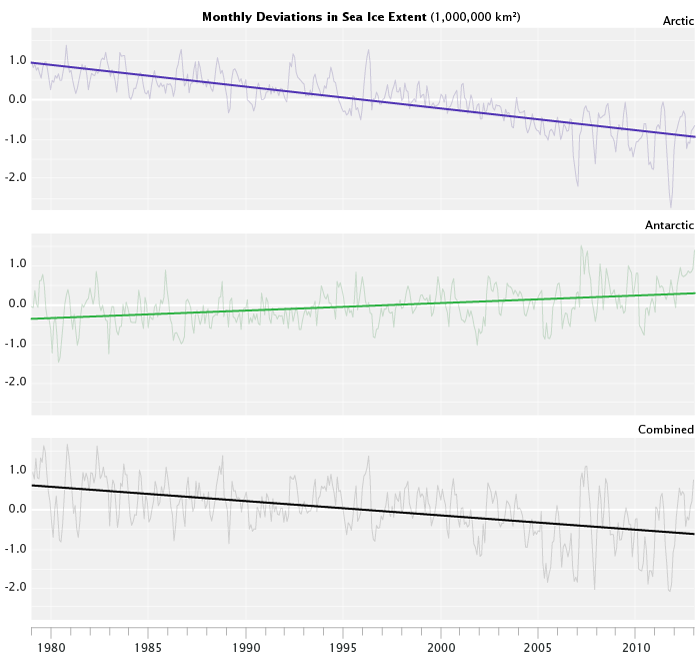 With sea ice volume hovering just a hair above record low values and with multi-year ice reduced to the lowest levels ever seen, Arctic sea ice is as thin as it has ever been. 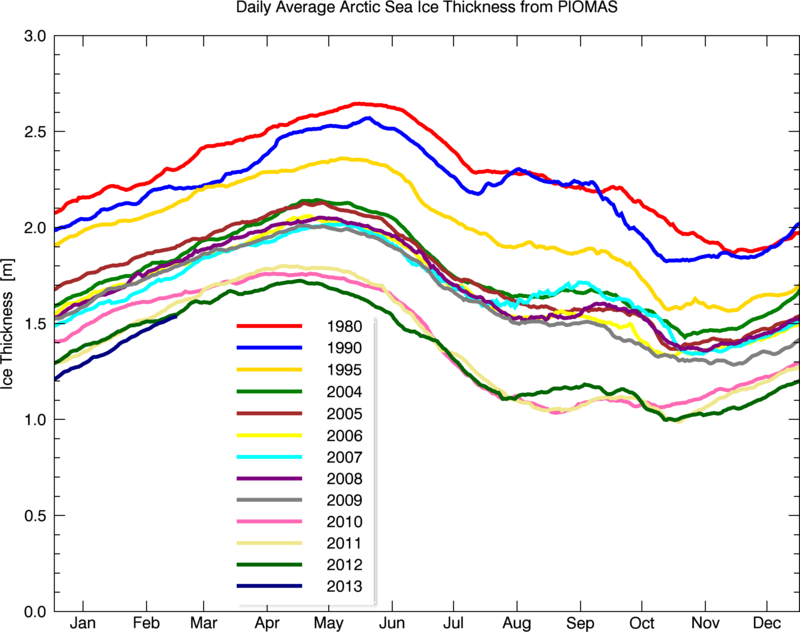 The below thickness graph from PIOMAS shows that current ice thickness is even lower than last year’s record values. Thin ice is more at the mercy of wind, warmth and weather. So it is likely a primary factor in the current ongoing cracking event. It also presents serious risk for large melt events as the spring and summer season ramp up. In the current Arctic weather pattern, a powerful negative Arctic Oscillation continues to dominate. The strong high pressure system that developed over the Arctic last week has drifted into Baffin bay, reinforcing the ridge/blocking pattern over Greenland. Forecasts seem to indicate a gradual weakening of the negative oscillation over the next seven days. 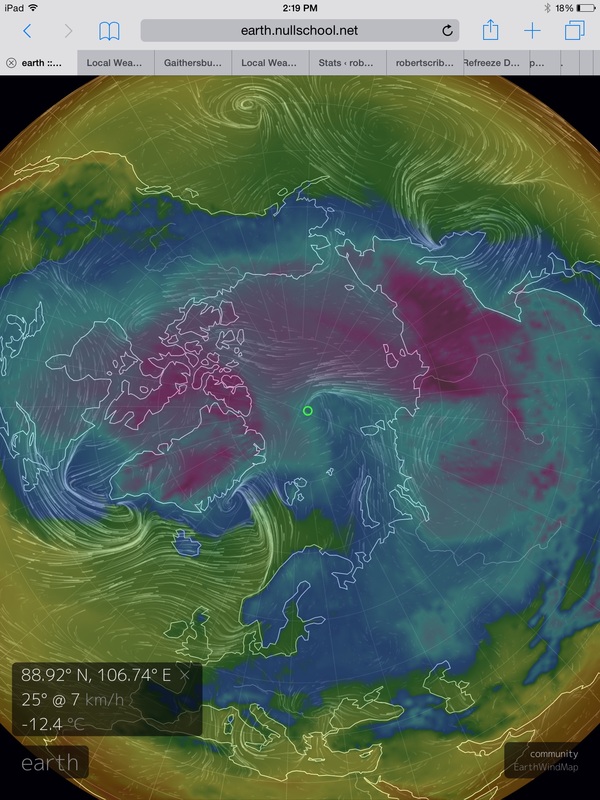 Heat transport into the Arctic remains high with continued warm air influx over Greenland and Eastern Siberia. The result is temperatures well above average for much of the Arctic. These conditions: persistent warmer than average air temperatures, continued negative Arctic Oscillation, and cracking, mobile ice would seem to favor continued slow melt over the coming week.